Each month, Finders Seekers invites you to accept a mysterious mission from the head seer. These “finds” are located in cities around the world and involve high stakes, cryptic puzzling, and shadowy societies! You’ll need a clever mind and some google-fu in order to piece together the puzzles and complete the find! And when you do, you might even receive a reward! This month takes place on the island of Mont Saint Clair in Normandie, France! A site of great historical importance and geographical interest, it seemed like this would be a very interesting visit. I was a little disappointed to see that the props within this month’s box were quite a bit less involved and immediately engaging as those we received in last month’s superb Mexico City box, but since Finders Seekers had markedly improved from month to month recently, I wasn’t too worried. Then we started the first puzzle, and it all went mostly downhill from there. There’s one excellent and intuitive puzzle near the end that plays with perspective a bit, and is set up cleanly while still presenting a challenging interaction. Another puzzle dealing with perspective allows for a fun solve that also provides the only tactile prop within this month’s box. Where to start with this? Of the usual eleven puzzles presented within this box, I enjoyed only 2. Usually, there’s a vague and/or frustrating puzzle within a Finders Seekers box, which is a symptom of having so many puzzles, but it’s easily overshadowed by the abundance of better puzzles and tactile interactions. Here, it seems like every other puzzle is built to frustrate through vagueness and artificial difficulty that is clearly the vast majority of the 4-5 hour recommended solve time. We took a little over 3 hours to solve this box, and unfortunately, most of that was wandering off to play with our cats because the hunt just could not hold our attention or interest for very long. By the end, I don’t think either of us cared any longer, because we left the last puzzle unsolved due to a combination of frustration and complete boredom with the whole thing. The hint system continues to prove subpar, and this boxes attempts at hints were a complete disaster when we needed them. The initial puzzle I previously referred to is presented without any real context, and the solution is mind numbingly insipid. It’s a difficult one to figure out, but only because it breaks the usual conventions of a Finders Seekers Find, and gives you no reason to expect that it would. Further on, there’s an algebra puzzle of the type we’ve seen several times before and still groan upon uncovering, a maze filled with inexplicable red herrings, (and I actually like mazes,) a banal word puzzle of the sort one would find within a variety puzzle book for five bucks, and enough anagrams to fill an extremely boring lifetime. The box as a whole just feels like so much filler in order to pad the gameplay, and never really engages the player in any meaningful way. If anything, this experience is an exemplar of the fact that quality does in fact trump quantity. Longest advertised solve time, lamest puzzles. Mont Saint Clair was bad enough that the poor quality of the game experience, coupled with the notice Finders Seekers put out stating that over the next two months, they would be rereleasing older boxes instead of new content, I cancelled our subscription. For 30 dollars, the experience just doesn’t hold up this month, and it’s bad enough to erase the good will built over the last few months. I don’t recommend this box, and would be wary going forward. If you want to subscribe regardless, you can order your next adventure here. If you sign up through our link, we’ll earn credits towards a free box, and can bring you more content! You can read the rest of our Finders Seekers reviews here! Donald Trump has decided it’s high time his face be immortalized on a new banknote, and of course, it must be a one thousand dollar bill. (Weird, right?) Your group of thieves have decided that it’s high time you quit your nine to fives, so you’ve hatched a plan to steal the plates used to make the bill itself before the release of the money, ensuring you have plenty of time to crank out enough counterfeit bills to keep you comfortable for life. We were led into the main area from the huge entertainment center, and just like when we entered Riddle High, the sounds of shrieking children immediately faded away, leaving us in the dark environs of the Federal Reserve. After a quick briefing, we began scouring the room for our way in! There are some very interesting puzzles and interactions peppered throughout the game flow of Federal Bank Robbery that we hadn’t seen before, and even though some were quite simple, they still were a lot of fun to complete! A lot of great tactile interactions come into play, and moving around the thematically fantastic props really helps you feel the part of a thief raiding the Reserve. Many puzzles rely on technical solves, using that magic to create excellent challenges throughout the room, and ensure that surprises are well hidden until they are needed. The later part of the game really ramps up with a few of those surprises, and stays fairly intense from that point to the ultimate climax of the game. Though the storyline is fairly light, the movement through the game is intuitive and each gate along the mostly linear path provides a sense of ongoing progress throughout your heist. The theme itself centers around Donald Trump, a highly divisive politician, and it’s weirdly jarring to have that be the basis of an escape room based on a heist. While it’s one hundred percent believable that he’d want to plaster his face on a new thousand dollar bill, it just seems weirdly out of place within an escape room. One puzzle in particular involves an ambiguous trivia question that requires outside knowledge, nothing that most Americans won’t already know, but outside knowledge is still unacceptable at any rate, especially at this location, which is geared towards families and kids. One puzzle’s solving method is fairly straightforward, but the trigger is fairly well hidden, and there’s no prompt to let you know that the solution worked until you see it, causing lost time and a small amount of frustration. The concept overall, however, is very cool once you notice it. For the Federal Reserve, the main area feels pretty sparse, as the set design is quite Spartan for the most part. Playing Federal Bank Robbery was fun, though admittedly the inclusion of Trump throughout was fairly weird. Jarring nature of that addition aside, the game itself provides a fun, family friendly challenge that beginners and enthusiasts can enjoy. If you’re craving further escapes after your trampoline or VR adventure, you should definitely begin your Federal Bank Robbery here! Full Disclosure: Adrenaline Entertainment Center Columbia provided comped tickets for our team. You and your team are sailors aboard the Steel Shark, a submarine tactically important to the United States Navy. You’re holed up in your bunks when suddenly, an alarm sounds and you notice that the oxygen levels are dropping at a dramatic rate! Luckily, there’s about an hour of air left for you and the crew. On the other hand, the whole area seems to be on lockdown! It’s up to you to discover the saboteur, find the oxygen tanks that have been removed, and return them to their proper place before you all sink to a watery grave! Entering the (possibly) doomed submarine was fantastic, as the initial set design of the first room presented a convincing bunk area of a submarine. We were disappointed that there was no Queen/Bowie music, but the room itself and our briefing got us excited to begin our escape! As mentioned, the bunk room is highly immersive and uses lighting, tech, and in theme props to transport you to 1944. The puzzling is also up to the task, presenting tactile challenges and historically appropriate interactions that work well within the game flow. Most of the game is linear, with a slow build of collecting various pieces for late game puzzles helping mark your progression organically. Teamwork is crucial within this room, as many puzzles require two or more players to pass information back and forth efficiently. Perception based interactions are fair, and don’t fall into the cliché trap of hiding things in out of the way places just to artificially increase the difficulty. The build to the final meta-puzzle is fantastic, and the ah ha moment we received upon solving it led to an appropriately climactic conclusion. Though the initial set design is awesome, the further we delved into the submarine, the more basic the environs became. Unfortunately, by the end, the immersion was struck dead as I no longer had the feeling that I was in a submarine, but rather in the final room of a fairly basic escape room. The solution to one of the codes comes across very strangely, as the method to solve would suggest full words, but we ended up confused for a while before trying what seemed to us to be a random amalgamation of letters. This was a one off deviation from the norm, so it was extra strange to find. One puzzle interaction is one we experienced within another room at Escapology, and it was a fairly basic one we’ve seen several times, so it ended up being a fairly bland interaction overall. Under Pressure is Escapology’s most difficult game, and it presents an enjoyable, if sometimes flawed, challenge! The historical nature of the room, as well as the initial set design are more than enough to entice anyone interested in the nautical World War II theme. 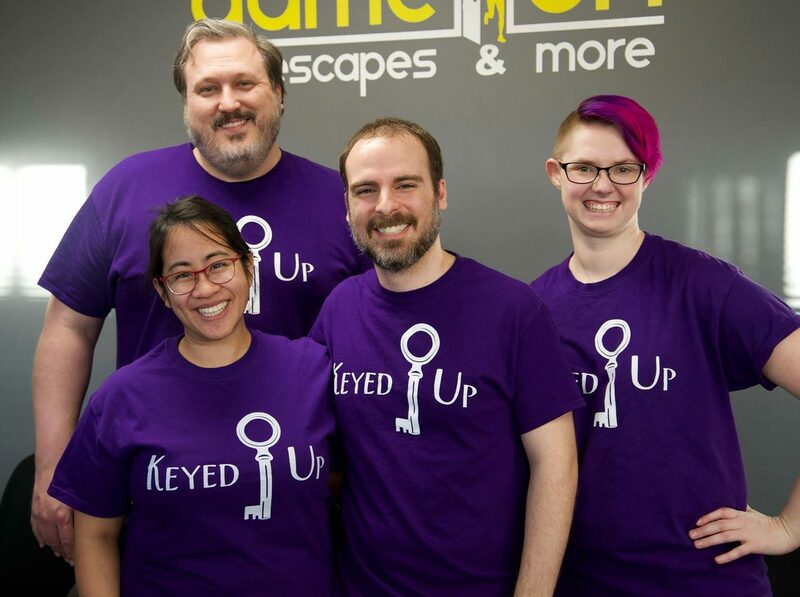 I’d recommend experienced groups giving it a shot, though beginners should do a few rooms first in order to get a feel for how escape rooms work. Book your time in the Steel Shark here! Full Disclosure: Escapology Columbia provided comped tickets for our team. Detective Cam Jones woke up to a bloody letter and some wolfish hair clippings the other night, and he’s convinced he’s hurt his girlfriend. Why? Because he’s definitely a werewolf! It’s a problem that plagues us all, really. Cam has contacted Sullivan to figure out what’s going on, but will turn himself in to the police before the next full moon if Sullivan cannot convince him he isn’t a creature of the night! Convinced Cam is absolutely not a werewolf, as any sane person should be, he enlists your help to solve the case and find out why someone wants to make Cam think he’s a raging best and for what possible purpose! It’s wild, it’s silly, it’s Halloween themed, and I love it! This is Cam. Cam thinks he’s a werewolf. Cam’s a moron. Don’t be like Cam. October truly is the greatest month of them all for subscription boxes! With so many jumping on the Spooky Train, the horror aficionado in me is on cloud nine! I figured that Sleuth Kings might come out with a haunted mansion case, Scooby Doo style, or perhaps a creepy serial killer, but what arrived on my doorstep was even better than I imagined it could be! Only Sleuth Kings could take such a ridiculous premise and really knock it out of the park! Most Sleuth Kings boxes contain a little bit of humor to either lighten the mood or just keep the fun going, but this one is the most absurd and humorous overall. I can’t say I was expecting it from the Halloween themed box, but I certainly didn’t mind it! The surface story itself is fairly predictable, but the underlying mystery of why all this is happening is actually pretty intense and engaging! The props included all tie in well with the spooky case, and are great fun to interact with, with each main item containing a great, multilayered puzzle. The game flow works excellently, per usual, but the layers and tie ins to other props feels more smooth and natural than usual. There are so many moments in which we were stuck thinking about the puzzle when we’d hit on that one intuitive line of logic and begin tearing through the clue, satisfied with our puzzler’s high. One of my favorite puzzles from this box took a basic code breaking interaction that we’ve seen several million times at this point, mixed it up, threw a few challenging bread crumbs along the path, and created an elegant puzzle that takes some real thought to solve. It’s this sort of thing, taking a puzzle style that has become completely run into the ground and turning it on its head to make a really satisfying puzzle that separates Sleuth Kings from other boxes that prefer quantity over quality. As we progressed through this adventure, this quality held, with devious puzzles just pouring forth from the box! Last but not least, the new hint system is awesome, allowing hints to become on demand without the pesky wait that depends on your email server! Not only does the hint delivery system improve, it’s done in a perfectly thematic way. It’s great to see this character still hanging out in the Sleuth Kings universe, and I’m glad that there was a way to continue to include her in future cases. For purists, the option to email Sullivan for hints is still available, so it’s a win all around. Oh Sullivan, you are just getting so sneaky, huh? One puzzle involves sound which gets a little too obnoxious. Luckily, there’s a mute button that doesn’t affect how you determine the solution in the slightest. Halloween boxes are apparently spot on the best! I don’t have anything else to say here! Case 013, The Beast Within is such a great puzzling adventure! I absolutely recommend checking it out, as though the premise is completely ridiculous, it’s also completely compelling due to the narrative genius of the writers. You can get it from the Sleuth Kings archives, and should you decide to subscribe monthly, you can use the promo code ESCAPEADVENTURE to get $5 off your subscription here! You can also read the rest of our Sleuth Kings reviews here! After a tragic fire destroyed the Pleasant City Hotel in 1953, no traces of the 13th floor were ever discovered…no debris, no guests saved, no bodies found. Some say the floor never existed, the staff however, believe it is still very much alive and thriving. No one knows the whole truth, all they know is that sometimes guests never manage to make it up to their rooms, or never make it back down. Will you discover the secret of Pleasant City Hotel? Or will yours be the next name added to the list of mysterious disappearances? We previously were set to visit Uptown Escapes in July, during our last Charlotte area trip, but the day before we left, the business suffered a freak lightening strike, knocking out their A/C during one of the hottest months of he year! Luckily, we were able to make it out a couple months later, and the owners were very accommodating! The ambiance of Uptown Escapes is readily apparent from the time we entered, with no overhead lights on and lanterns placed strategically about, giving the whole place a spooky feel. I love when the room themes “leak” out into the lobby, and this was an excellent touch to get us in the mood for some creepy escapes! The mood having been set well from the start, we were led into a simple, yet amazingly designed holding room for the briefing. The way it was set up, there was a constant creeping dread as we were never quite sure what would happen next, or where that happening would come from. After that, we were ushered into a spooky “elevator,” which provided even further creepiness through excellent light and sound design! Arriving on the 13th floor was a breathtaking moment, and the set design itself is top notch, with the whole experience looking appropriately burned out and aged. The room opens up in unexpected ways, allowing for some great interactions while making our way into the titular Room 1306, and providing an amazing puzzling experience while remaining thematically lower tech for the most part. Where there is technology, it works seamlessly and magically, adding on to the ghostly vibe that is constantly being emitted by this room. The storyline is always evolving as you progress through the room, and the atmosphere and narrative work perfectly with the game flow to provide a true escape adventure that remains completely immersive throughout. There is more than enough to do, via the non linear presentation of the game, and we never found ourselves milling about, waiting for the next part. All puzzles were cleverly implemented, and were a delight to solve. One puzzle contains a red herring that feels unnecessary, holding up progress but not in a way that felt challenging. I do understand the impetus behind it, but it could’ve been presented differently to preserve challenge without cluing towards a solution that wasn’t there. Room 1306 is an atmospheric masterpiece, blending awesome set design, fantastic game flow, and an appropriately spooky story into an immersive adventure that enthusiasts and beginners alike are sure to enjoy! I am so glad that we were able to make our way to Shelby in order to experience Uptown Escapes’ haunted hotel, and highly recommend that you do too! You can book your stay in Room 1306 here! Full Disclosure: Uptown Escapes provided media discounted tickets for our team.